Salvation – To share the love of Jesus Christ with everyone involved in an Upward ministry. Character – To help every child grow as Jesus did – spiritually, physically, mentally, and socially. Self-Esteem – To help every child grow in their understanding and enjoyment of sports. 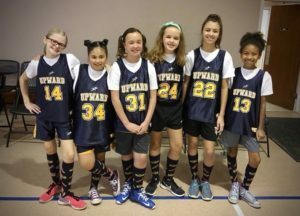 Upward SportsTM is a first-class sports experience for children that emphasizes healthy competition, sportsmanship, skills building and fun versus the “win-at-all-costs” mentality associated with many sports leagues. The 2019 season has concluded. Check back here for more information on upcoming dates! We will post important information for upcoming seasons here – check back regularly! Our 2019 season has concluded. Thank you for all who served to make this a successful event. We are grateful! Check back regularly for updates and information on upcoming events.